Great build thread & great video. Best luck can't wait for pt 3. This is awesome!!! Great thread and very educational. Looking forward to part 3! Outstanding! Love the vids and detailed pics. More work on the engine rebuild, cam housings, camshafts, timing chain housings and the sprocket alignment. I had a couple of issues, firstly I'm not very skilled with the crows foot wrench for the sprocket retaining nut. I really struggled to get it to 110ft-lbs multiple times without the wrench slipping off, so I ordered the Stomski racing cam nut tool. I also didn't realize the cam sprocket shims were 0.5mm and not the 0.25mm as described in Waynes book but all worked out and I'm ready to tackle the cam timing next. Wish me luck on that one! I made a little video of the process. Clean cam housings, cam shafts with the E-cam grind, oil return tubes, o-rings and all the hardware laid out on my clean tray. New oil return tubes installed, when I ordered them they were yellow zinc and when they arrived .... they weren't. I loosened the head stud nuts to give myself some wiggle room for the cam housings. Installed the cam housings dry, no Loctite 574 yet as I need to measure for the valve to head clearance. It all needs to come apart again. Everything I need laid out on my clean tray, parts, gaskets, 0-rings and the tools to do the job. 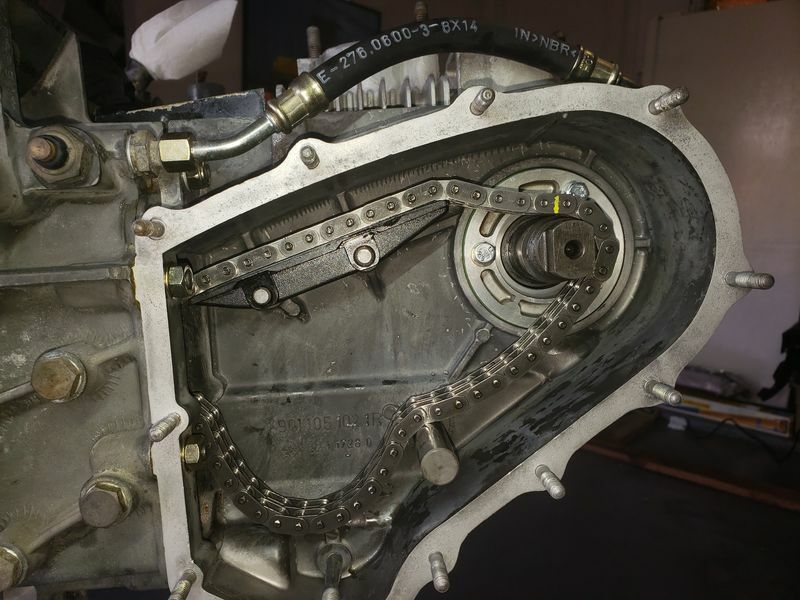 Installed the timing chain housing with a dry gasket and the chain ramp with the short end facing in. Installed the camshaft end plate with paper gasket and o-ring, large washer bevel side in and 3 shims. The woodruff key give me some grief even though I test fit it on the bench. Sprocket flange over the camshaft. I got confused about the thickness of the shims, the book says 0.25mm but they are 0.5mm. I started with 3, went to 4 and then went back to 3 on the right side! 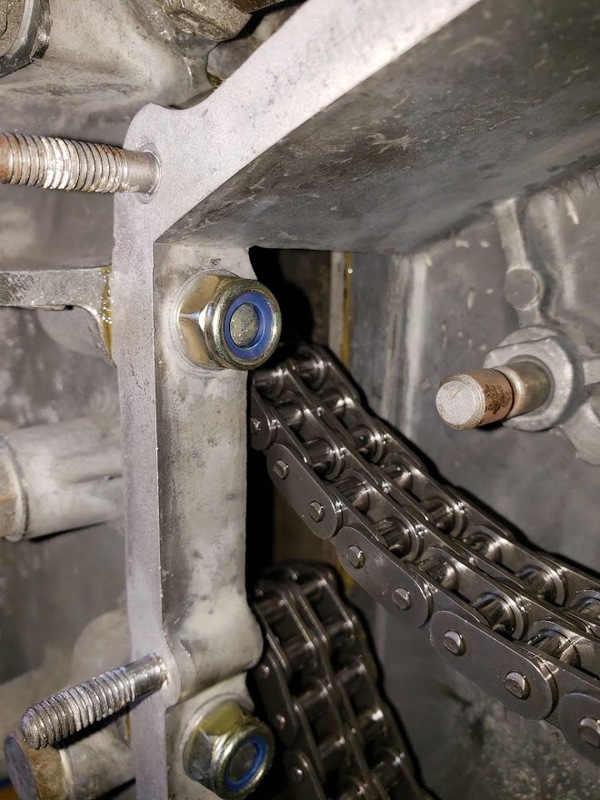 Tightening the retaining nut to 110ft-lbs multiple times as I swapped the shims was very difficult with my novice skill levels using the crows foot wrench, I've ordered the Stomski Racing cam nut tool for the next step. Measuring the sprocket alignment from my straight edge. The camera tripods were a set of helping hands and worked out great. The measurement on the left side was bang on with 3 shims, the right was close enough with 3 shims also. Very nice! Thank you for taking the time to document your build. You will like the Stomski tool for tightening and loosening the cam nut ! Much easier to use. On the nuts inside the timing boxes (holding the box to the case and the nut that holds the tensioner), I have been counseled to use standard nuts with wave washers as opposed to the fiberlock nuts. I noticed that the fiberlock was not getting well down over the threads, thus the question of their being effective. The answer was go back with wave washers and standard nuts. You can see the issue here..
Great advice! Thanks! I will do the same and go back to regular nuts with wave washers! Last edited by kav; 11-17-2018 at 08:54 AM.. I just wanted to thank you for making the effort of video taping your process. I am sure it slows things down, and takes a lot of time to edit. There are a lot of people out here who always wanted to get near an engine rebuild, but never got the chance. For most of us, this is as close as we'll ever get. What is the brand of the Torque Adapter that is shown in the video @ 8:23? Kav, thanks so much for taking the care and time to post your videos. Very professional and helpful. I hope to follow in your for steps one day with my non-driving ‘73 911T targa project! Look forward to seeing you behind the wheel of your beautiful 911 in 2019! Your videos were a massive help in my build. The videos have been one step ahead of me the whole way along which has been awesome! I've just caught up and am finalising cam timing and piston / head clearance checks.